It doesn’t matter if you’ve made one dollar or one million dollars from your art, one thing will always hold true: you can never stop working. The key to being a successful creator is not dependent on how much talent or luck you have. It depends on how much effort you are willing to put in. It depends on how persistent you are. It depends on showing up every day to do the work. Sure, talent also plays a role, but there are millions of talented people who never find success. Sure luck plays a role, but luck can only get you so far. Hard work, directed in the right place can take you farther than talent and luck ever could. We all want to believe our work will speak for itself. We keep hoping and praying them someone will come along and discover us. But what if we are discovered? What if someone came to you and made all of your dreams come true? Would you stop working? What would you do? Just ask all the one hit wonders what a few minutes of fame did for their careers. Are they still rich? Are they still adored by fans? Nope. 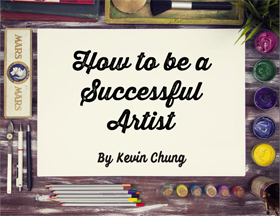 In order to build a sustainable career as an artist, you must keep going. You have to show up and do the work. Artists like Usher know how to stay on top. They are constantly creating new work. They innovate and try different things while everyone else becomes stale. They are willing to put in the hours while everyone else is taking it easy. You may not want to be rich and famous like Usher, but everyone would love to be respected like he is. It doesn’t matter whether or not you like his music, you can still admire the fact that he has been able to build such a sustainable career. You can do this too. You just have to be willing to put in the work to make it happen.